Covering 225 river miles, this trip offers all the scenery, side canyons and whitewater excitement of our full canyon trip with the glories of Marble Canyon, the mysteries of the Inner Gorge, terrific side hikes and Indian ruins, crystalline creeks and waterfalls, cactus gardens and whitewater galore. We explore the numerous side canyons, which crisscross this magnificent region, each having its own unique attractions, just waiting to be discovered. Our last night is spent camping in the shattered Hurricane fault zone before we head to Diamond Creek for our take-out. 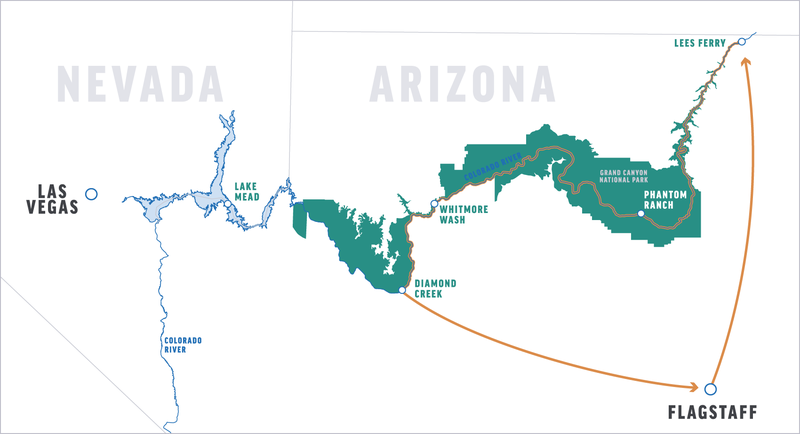 When we reach Whitmore Wash, we may do a passenger exchange. Some of your fellow passengers will helicopter out at this point, while others will helicopter in to join us for the last few glorious days on the river. As the canyon opens up we cross into the shattered Hurricane fault zone and then head west. Still in our sleeping bags, we watch the sunrise brighten the cliffs above our camp. Hours have long since ceased to matter and the days now blend together. Rapids and side canyons stand out in our memories, but have lost their places in time. A sense of sadness fills us as we round that last bend and reach Diamond Creek. After loading and de-rigging the boats we board the van, which carries us across the reservation to Peach Springs and then returns us to the DoubleTree Hotel in Flagstaff, arriving between 2:00 and 3:00 PM. Flagstaff is the meeting and ending point for your Lees Ferry to Diamond Creek trip. On the final day of your river adventure, you will be returned to the DoubleTree Hotel in Flagstaff. You should arrive back by approximately 2:00-3:00 PM. There are 42 rapids rated 5 or higher on the Lees Ferry to Diamond Creek section. Whitewater in the Canyon is rated on a scale of 1–10 (unlike most western rivers which use the I–VI scale). A “1” is a small riffle, and a “10” is the most difficult rapid still considered runnable. The two most noted of the Colorado’s rapids, Crystal and Lava Falls, are both rated a 10. The intensity of all rapids naturally depends on the water level, so readings for low and high water levels may vary slightly.